Exciting news from Motorola this week as they’ve just announced details of two new smartphones, a new Moto G and a new Moto X. Both models are new and upgraded versions of their namesakes which were released in 2013. Here’s all you need to know about Moto’s new generation smartphones. The original Moto G mobile phone was Motorola’s best-ever selling smartphone with a competitive price tag and impressive specs for a budget entry-level mobile phone. Motorola’s new 2014 Moto G model is also expected to be hugely popular offering excellent value for money and a great range of very decent features. Motorola have retained the compact design for the new Moto G and thanks to slim bezels, they’ve managed to squeeze an extra 0.5-inches onto the screen size giving it a 5-inch IPS LCD screen. The screen resolution is 720 x 1280 pixels which gives a pixel density of 294 pixels per inch. Also benefitting from an upgrade is the rear 8-megapixel camera with autofocus and an LED flash. There’s also a respectable 2-megapixel camera on the front. 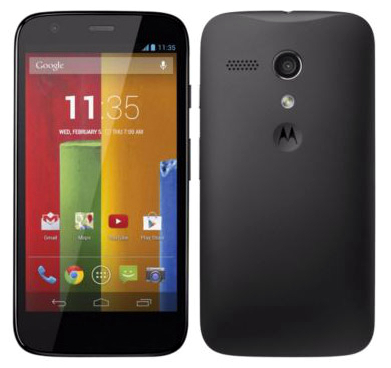 The new Moto G will run on the latest Android KitKat 4.4.4. It’s powered by a 1.2GHz Snapdragon 400 quad-core processor along with 1GB of RAM. Available in black or white, there’s also a choice of onboard memory (8 or 16GB) which can be expanded up to 32GB with a microSD card. As well as the new Moto G handset, Motorola have also unveiled a new and improved premium Moto X smartphone. The new Moto X sports a top of the range design and now boasts a 5.2-inch AMOLED FULL HD display with a screen resolution of 1080 x 1920 (424 pixels per inch). The new Moto X really is a beautiful looking mobile phone. Motorola have kept their trademark curved design and have now included a metal frame which contours elegantly along its edges. If you like your smartphone to stand out from the crowd then the Moto X will certainly do that. The back of the phone can be customised with a choice of many different materials and finishes which include real leather and wood in a choice of colours thanks to Moto Maker’s customisation service which will soon be available in the UK. There’s also the option to engrave the back of your handset, add extra storage, choose the colour of the metal surround and even customise the colours of the grilles. An exciting new feature for the Moto X is Moto Actions which enable you to wake-up the phone with a voice command, silence it by waving a hand over it when its ringing and even get the handset to display notifications using a hand gesture without properly waking it up. The premium new Moto X will also be very competitively priced offering a top of the range smartphone with more bang for your bucks. There is a very impressive 13-megapixel camera on the rear with a dual-LED flash and a 4 x zoom. It records in 4K with HDR and on the front is a 2-megapixel 1080p secondary camera. Like the new Moto G, the Moto X will run on the latest Android KitKat 4.4.4 and will be upgradeable to Android L when it becomes available. The interior of the Moto X is also high-end with a 2.5GHz quad-core Snapdragon 801 processor, a choice of 16 or 32GB of onboard storage and 2GB of RAM. It also sports a 2300mAh battery which boasts a turbo charge feature, just 15 minutes on charge will be enough to power the Moto X for around 8 hours. The new Moto G and Moto X X will be available soon so watch this space for our fantastic offers.